Meru began with a vision that sooner rather than later most enterprises would operate in an all-wireless environment: the network edge would need no wires, and a wireless LAN would fully support the enterprise. We wanted users to be able to count on the wireless network to access the content and applications they needed to get their jobs done, and we wanted IT managers to have the power to prepare their networks for the next generation of mobile applications. To bring that vision to life, we created a unique architecture that frees networks from the limitations of client control. With mobility in mind, we custom-built a network that could deliver the seamless coverage and simple scalability that are only possible with a single-channel design, a network that could virtualize wireless resources to ensure smooth, predictable performance. Today Meru’s innovative approach to wireless networking has expanded to open, agile and intelligent solutions that deliver best of breed products which services thousands of customers around the world. Meru wireless LANs are specifically designed for environments where high-density wireless traffic is generated by business-critical applications. In all kinds of enterprises, IT managers are finding that wireless demands are exceeding the capabilities of their current networks legacy systems meant for casual use and low-volume traffic. With the rapid consumerization of IT, they’re facing more and more mobile devices that have to be provisioned, managed and secured. They’re confronting high-bandwidth applications demanding more and more resources. They’re struggling with the need to scale up an old network to accommodate the rising tide of wireless traffic and to accommodate users in many locations, from headquarters buildings to home offices. They’re experiencing the emergence of the distributed mobile enterprise, and the stress of an infrastructure that’s unprepared. And they’re turning to Meru for solutions. Expand to support the demands of BYOD, cloud services, IoT, voice, video and other mobile applications. A Meru WLAN scales up easily without time-consuming and costly site survey plans. Manage the Wi-Fi network with small staffs and tight budgets. A Meru WLAN is simple to deploy and manage, with low total cost of ownership. Ensure consistent, high-quality mobile services. 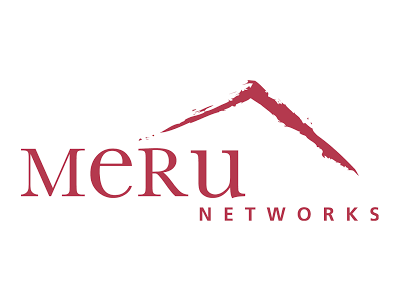 Meru creates a reliable, seamless network with no soft spots. Real-time RF resource optimization allocates bandwidth fairly and predictably. At the same time, Meru lets IT managers leverage their existing investments in virtualization, cloud computing, and mobility the technologies that allow today’s enterprise to become fully distributed. Meru provides a high-performance wireless infrastructure that is easy to deploy, manage, and expand. The Meru infrastructure is built from the ground up to support high-user density, extremely mobile users, and business-critical voice, video, and data applications. It’s an all-wireless network that delivers a consistent, interactive experience for all users no matter what applications they are running, no matter what device they use and no matter how many other users are on the network. Meru’s design is easily scalable and keeps IT departments ahead of the curve as their users become more dispersed and mobile, and their network demands grow. It’s an infrastructure designed, from the beginning, to future-proof the enterprise network. Whether your classroom is flipped or your learning is blended, Meru Education-Grade Wi-Fi can ensure fair and reliable access to online materials and applications – even when students bring their own devices and the whole school connects at once.